This whole pregnancy, I have had a huge aversion to meat. Specifically big pieces of meat. It has been super frustrating for me to say the least because I haven’t been able to enjoy some of the foods that I typically love so much. Even the sight of it was enough to get my nausea rolling… that was until this meal. My mom used to work at Sizzler once upon a time a very LONG time ago. One of her favorite dishes from Sizzler was their Malibu Chicken. She has since made it for our family time and time again. However, it had definitely been a while since the last time I had eaten this wonderful meal. Well, she made it for our Easter dinner and I could not stop eating it and told her she needed to write down the recipe immediately for me. It was the first thick piece of meat I have thoroughly enjoyed and gobbled up in my almost 37 weeks of pregnancy. I have had it for 2 dinners since. That is how much I LOVE this recipe. The dipping sauce compliments the chicken so wonderfully. You can all thank my amazing mom for this recipe… and trust me, you are not going to want to lose it! This has officially made it into my my TOP 5 FAVORITE Dinners of ALL TIME! That is saying something. This chicken is AMAZING! SO much delicious flavor wrapped into each bite. Combine egg yolk and garlic and pour into plastic bag. Place chicken inside bag, seal shut making sure no extra air is inside, and make sure the chicken gets coated with egg yolk/garlic mixture. Place in fridge and marinate chicken for 4 hours. In a medium bowl, mix panko, parmesan cheese, garlic powder, salt and pepper and dump evenly in the bottom of a 9x13 baking dish. Remove chicken from bag place chicken in baking dish. Coat the chicken with mixture and bake at 350 degrees F and depending on the size of your chicken breasts cook for 40 minutes to one hour or until chicken is cooked through. Monitor it starting at about 40 minutes. 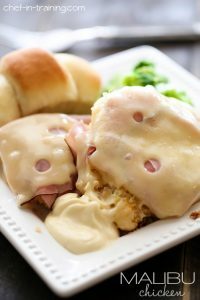 Place one slice of ham and once slice of swiss cheese over the top of each piece of chicken and bake addition two minutes until cheese is melted. Combine Grey Poupon mustard, may, yellow mustard and honey in a small bowl. Stir to make sure all ingredients are evenly combined. Use to dip chicken in. Wondering if the parmesan cheese is the fresh ground or the Kraft kind in the green jar?? As soon as you said Sizzler I remembered the mustard sauce HAVE TO MAKE THIS SOON!!! Thanks for a memory! I love this Nikki. Seriously, I was drooling at the site of the picture. And we are 3 weeks away from the birth of our new son, so I know exactly what you mean, and glad you found something you love to eat! Does your mom have any ideas how to make their lemon herb chicken? I've searched for recipes and none of them come out right. Congrats on the upcoming birth of your child. Hope it goes well! Why do you coat bottom of 9 X 13 baking dish with bread crumb mixture and then coat the chicken. Wouldn't it be better to coat chicken in a separate dish and then place into baking dish. I was wondering the same thing. And if after you coat the chicchicken, do you leave the remaining crumbs in the bottom of the pan when you bake? Do I bread the chicken in one baking dish and then put it into another baking dish? Or just keep it all in one dish? That part wasn't clear and I'm making this right now. Yum! Easy to see why you loved this, it looks great! You can never have too many great chicken recipes! Pinning! I'm so happy to see this recipe! When I was young, we would go to Sizzler after church and I ALWAYS got Malibu Chicken! And it HAS to go with the dipping sauce or it wouldn't be the same. Thanks for including the sauce recipe too! I'm trying this tonight! I love to get Pollo Milanesa at our local Cuban restaurant and this looks very similar. I am definitely going to have to try to make this at home. I think my husband will really like the addition of the sauce. Thanks for sharing on Tuesday Talent Show. I made this recipe almost exactly as it was written (just added a few more spices) and it came out amazing.. I have the pickiest husband and kids and it is hard to make something everyone loves... There were NO leftovers of this, that is how awesome it was!! Thank you for the recipe! I, as well worked at Sizzler back in the 70's and the Malibu Chicken was my favorite. Just found you and your blogs/recipes.... marvelous.... I stole malibu chicken and no-bake strawberry nutella eclair cake!!! Can't wait to make these, and thank you very much!! I also worked at Sizzler back in the late 70's when I was in high school. Malibu Chicken was my favorite. Loved the sauce and the creamy swiss cheese. I'm going to try this recipe soon. Thanks for sharing this. Thank you for posting! We had this for dinner, and it was wonderful. I use food dot com can just searched for this recipe...none were posted so I copied your recipe in and gave you the credit. Thank you! Why just the egg yolks & not the whole eggs in the coating? Malibu chicken was the only food I ever ate at Sizzler...well that and their big vat of blue cheese dressing on my salad! (let me know if you have a recipe for that!!) I've made my own version of Malibu chicken for years...but this sounds absolutely amazing and will be on my menu this weekend!! Thank you for sharing!! Add one more chicken breast. If you see that the egg yolk doesn't cover it add another. You could pretty much eyeball the rest of the ingredients. i live in Australia and wondering what the equivalent to 'Grey Poupon Mustard' would be here? Thanks for any assistance. Much better than the current Malibu chicken at Sizzler! Great memories though of family night at Sizzler when going out to dinner was a rarity! And yes Malibu chicken was a favorite. Thank you my favorite...remember this from Sizzler thanks again!! We have our two grandchildren – a 7 year old boy and a 4 year old girl – visiting for the week so I thought I would make this recipe tonight. They are like Mikey on the old cereal commercial: “he won’t eat it, he hates everything.” Well … this recipe, they ate, and ate, and ate. I would have to say this tops the all-time list of recipes I have ever made. Compliments were non-stop from the three others I cooked for. This is now a once-weekly permanent addition to our dinner menu for the rest of eternity. I have never heard of this- it sounds so great! Definitely sounds like a crowd pleaser when cooking for a family or parties. I can't wait to try this! I worked at Sizzler in high school (1991-1992). This is what I always got to eat when I was working! Thank you for sharing! Made tonight. Very Good! Will add to rotation. Hi, I was wondering if this is the exact same recipe as the one from Sizzler? My boyfriend only eats the one from there hahaha Thanks! Awesome! I also saw this recipe on another site that gave you credit. I found the other recipe as I was searching for the nutrition on your site and could not find that info. The food.com site lists the calories at 1400+ and fat and sodium off the chart for daily suggested percent. Would you help confirm the nutrition info? Thanks!